What potential shape will the recovery take? Are we prepared to take advantage? Do we have the operational infrastructure in place to take advantage of an upturn? Have we taken advantage of the buyers’ market for talent and other resources? How familiar are we with the impact of a recovery on our operations? Are we prepared to speak to our employees, investors and board of directors about the recovery and our plans to meet the challenges? The EOA provides an executive-level view of trading support capabilities, identifying key functional gaps and opportunities within your ecosystem of people, trading processes and the systems that support your business. A properly executed EOA will leave you with a summary of categorised and prioritised opportunities for improvement, a list of gaps to be addressed and, where possible, a gauge of the implementation effort to address them. The assessment is not intended to function as an in-depth review of your business practices, but rather as a measure of health and an executive summary of operational holes in your trading and risk management capabilities. The purpose of the exercise is not exclusively to gain knowledge but to develop an action plan, building the foundation for growth in anticipation of change. 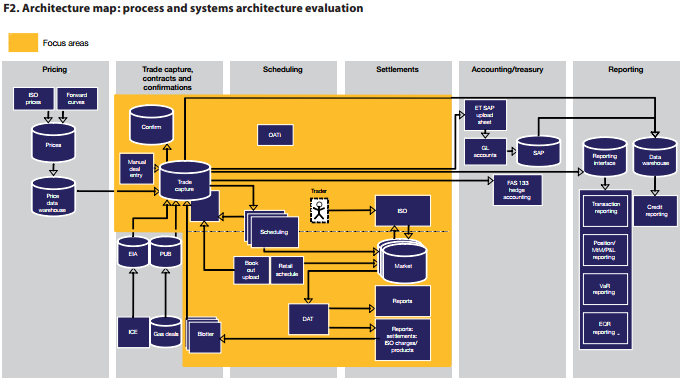 Improvement under way: issue recognised, mitigation on the way but may need additional attention• Non-critical: to be addressed as business grows but does not require immediate resolution The next step is to evaluate the cost and benefit of addressing each issue, as well as the relative ability of your organisation to implement solutions. A ‘valuation matrix’ can be used for this (see figure 5 on page 54). The output of the matrix is a prioritisation of each issue into one of four categories. 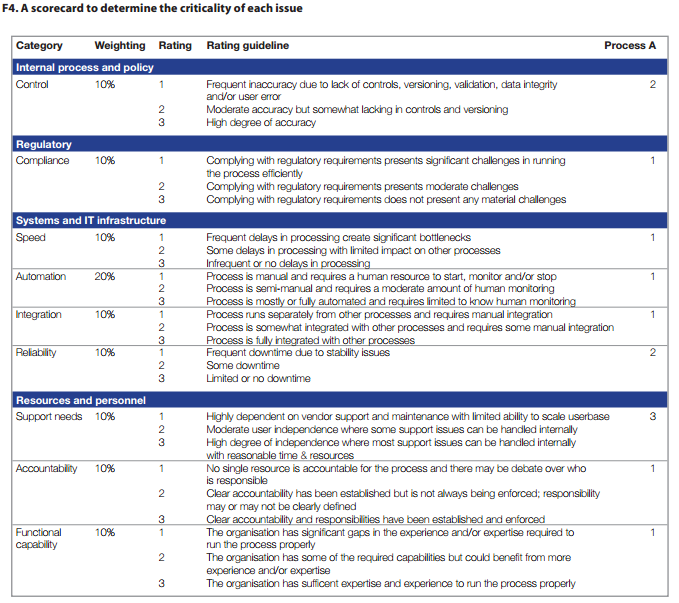 Note the initial ‘criticality’ of each issue remains depicted through colour-coding. 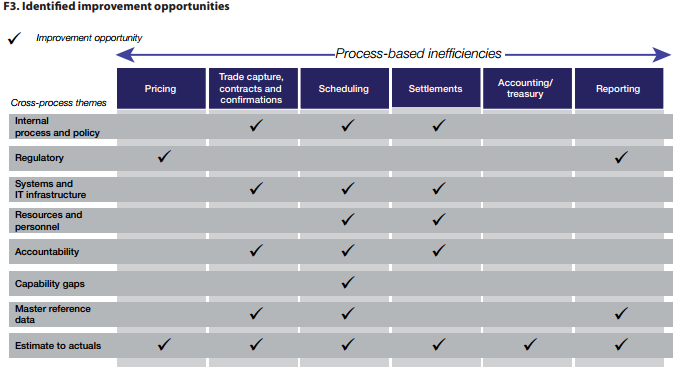 ‘Big opportunity’ issues are costly to address but the solutions can result in significant savings and efficiencies. Such issues should be addressed as soon as possible, but will require time, resources and investment. 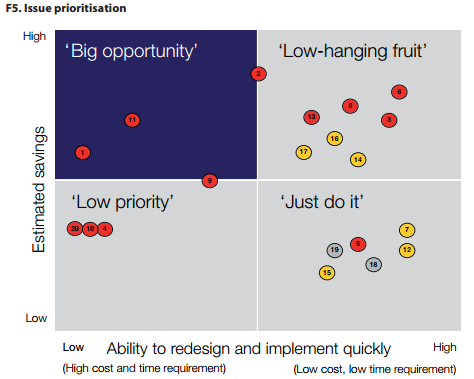 ‘Low-hanging fruit’ issues require relatively low cost and time requirements to address and can also result in significant savings. These issues should be addressed as soon as possible. ‘Just do it’ issues should be addressed quickly only if the benefits of the resolution are expected to outweigh the costs of implementation. Low priority’ issues should be addressed over time as resources become available. IV. Recommend options and review with key stakeholders After reviewing and prioritising inefficiencies and gaps, plan nearterm solutions to address immediate issues with a strategic approach, while simultaneously identifying a long-term integrated solution. These recommendations should be fully vetted by key stakeholders to ensure your organisation’s unique requirements and objectives are considered and addressed. 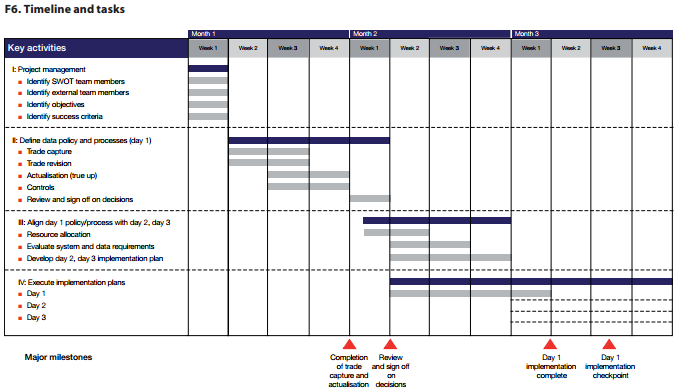 V. Develop an implementation roadmap Once solutions are agreed, develop a high-level roadmap for implementation (see figure 6 on page 54). Enite’s approach is to first ensure the appropriate people (resources) are deployed to manage the current and future business. This allows you to then improve and streamline your processes and implement the necessary technology solutions. Upon completing the EOA, management and executives will have a thorough overview of the health of your organisation and of its strengths and weaknesses. Understanding your capabilities and where to focus improvement efforts will leave you fully armed to capitalise on future market changes as they occur and will ensure operational support for your business’s growth strategy. The outcome of this study serves as a blueprint upon which strategic investment can be based.